write down the cakes and pastry recipes I’ve perfected over the years. shouldn’t have, it has another. between my sponge cakes and what they would consider the ‘real thing’. Gluten Free Plain flour. At the time of writing this, Doves Bread Flour doesn’t have Cornflour added but their Plain Flour mix does. For the fat, I like to use Trex vegetable fat. The solid one. I used to use White Flora but don’t think it’s available any more. I also mix half and half with ‘Pure’ non dairy spread. Depending on rich I’d like the pastry. 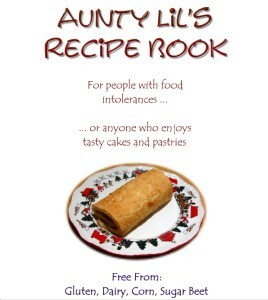 Recipes for Swiss Roll, Jam Tarts, Bakewell Tart and lovely Gluten free bread are amongst the recipes in this book. I don’t tell visitors my cakes and pastries aren’t made from wheat and dairy and no one has even noticed as yet.